I have some fun new sponsors this month and I hope you’ll check them out! Tonight I want to introduce you to Smart Decorating Ideas. 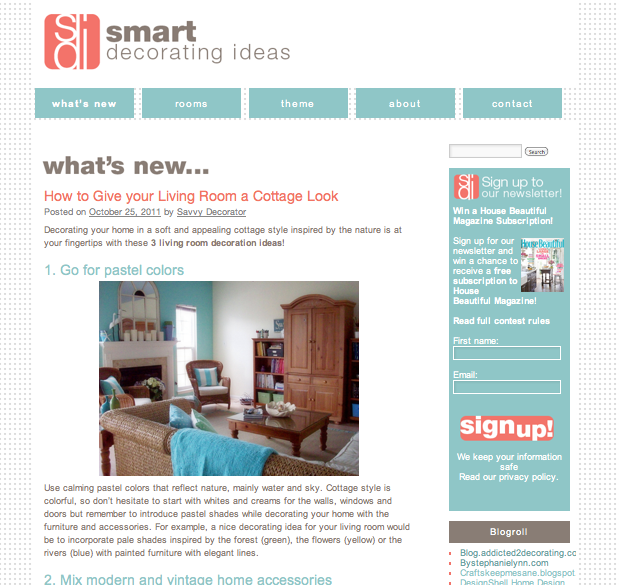 Smart Decorating Ideas is a resource for decorating projects for every room and occasion. They offer easy decorating tips and will also give you tips on how to decorate for special occasions. You all know I love tips and Smart Decorating delivers. I really like the easy and accessible numbered points they offer in each article. If you are grappling with questions on how to decorate, they are an excellent resource to keep in mind. Go ahead and sign up now for the FREE Smart Decorating Ideas Newsletter and you will be entered to WIN a subscription to House Beautiful Magazine for 12 months. When you sign up for the newsletter, you will receive the best ideas they have on their site every week! And now I’m excited to see what tips and tutorials you all have to share with us! Better late then never! I just linked up 🙂 Thanks so much for the party! I like the antique dresser makeover! Nice! Thanks so much for hosting the link party. I love looking through and seeing what everyone has created! So many great ideas already!! I can’t wait to go through some of them. Halloween was fun, but since I’m not a big Halloween decorator, I am ready to move on to new ideas for the next holiday. As always, thanks so much for hosting! Good morning! I linked up a tip today (#105)! Thank you for hosting! Thanks for hosting such great parties every week! Cheers. Hope your boys had fun last night trick-or-treating! I’m so thrilled to finally be able to participate in your link party. I’ve spent months enjoying your blog and your link parties — and have picked up some great ideas and inspiration.